From the outset, this play hovers between the deeply depressing and the insightfully humorous. The scenery sets the stage for a bleak, monotonous atmosphere, but is beautifully balanced by the comic banter between the characters and the, occasionally, overdone physical comedy. The overwhelming notion I got throughout the play was that of loss, especially that of family members who are still alive, and the fear of the world outside of the enclosed space of your home. Thus each character held a monologue that showed the loss or tragedy that their façade was hiding. These were undoubtedly some of the strongest scenes in the play; that of Pa, acted by Gerry Mulgrew, stood out. Sliding into the abstract, he described in terrifying details how a huge snake had entered the room of the ‘little mouths’ and gobbled them all up, and his desperate, but albeit futile, attempts to save them. Written down like this the scene seems strangely absurd, but brought alive by Mulgrewthe scene gave me goosebumps and has stayed with me since. Indeed, the dark scenes were held together by both the humourof the dialogue and the acting of the cast. 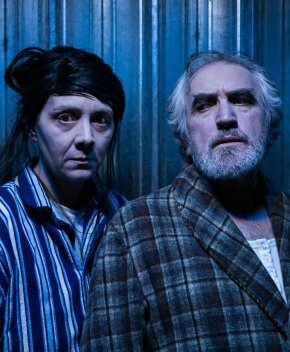 In particular Ma (Karen Dunbar) and Pa stood out, their witty exchanges providing the audience with the necessary comic relief whilst not dispelling the dark undertones of the play. Unfortunately, Neil played by Nalini Chetty often exaggerated her discomfort and sometimes pulled the atmosphere into the ludicrous, thereby taking away from the carefully balanced atmosphere. That said, her performance of the monologue which concluded the playeasily made up for this, as she finally exposed the sheer terror and tragedy of her situation. Aside from the acting, the best part about the night was undoubtedly the script. The balance of the bleak and depressing with subtle, revealing, witty humour is incredible. Martin McCormick, commissioned by a scheme to support emerging Scottish playwrights, has proved both his talent and the importance of encouraging local writers. Mixing mirth and misery – how much more Scottish does it get?